Reader Poh noticed that the new Inner Awareness Tank (left) is very similar to the Sun Salutation Tank (right) from early summer. 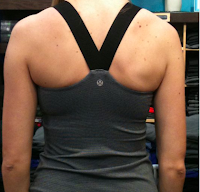 I believe the only differences in the two tanks is that the Sun Salutation Tank is shorter in length, has curved contrast design on it and the ipod pocket in the back and slightly different strap/neckline. 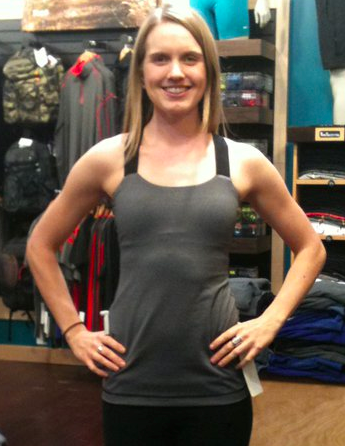 Both tanks are made of Luon Light and a have moderate support mesh bra. If you liked the Sun Salutation Tank from Summer but overlooked it as I did because of the length, the Inner Awareness Tank may be more up your alley. "Gorgeous Color! Run Swiftly Tech in Power Purple"